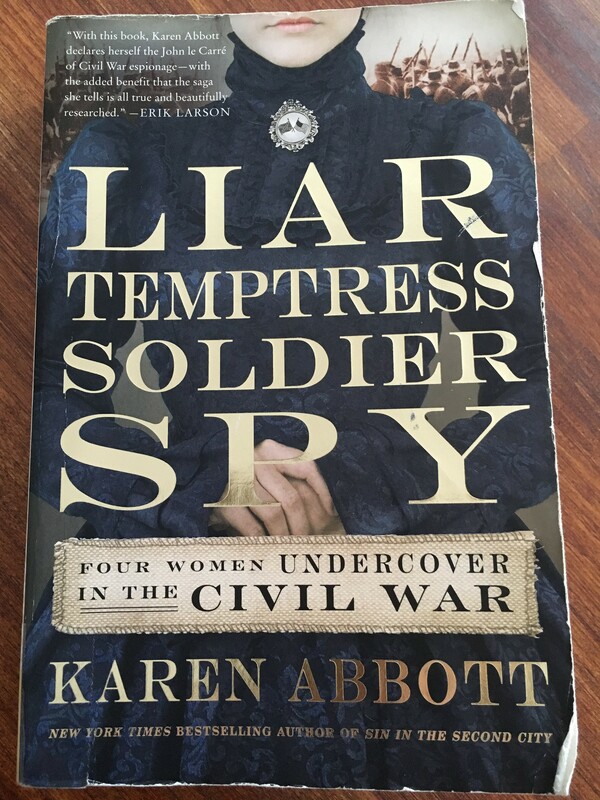 I just finished reading Liar, Temptress, Soldier, Spy: Four Women Undercover in the Civil War, written by Karen Abbott, and feel as if it should be required reading for all history students. The book covers the life of four women–two Confederate and two Union Army spies–who risked their lives for what they believed. Although non-fiction and exhaustively researched, the book reads like a fictional story woven with period detail, human emotion, and suspense. And how is it that I have never heard of these women? Seventeen-ear-old Belle Boyd became a courier and spy for the Confederate army using her feminine appeal and outrageous bravado. Emma Edmonds decided to live as a man to escape persecution from her father, then joined the Union Army, where she served in the bloodiest battles of the civil war before becoming a spy. Can you imagine the irony of her sneaking into enemy territory posing as a man taking on the “disguise” of a woman? The genteel Southern widow Rose O’Neal Greenhow, along with her young daughter, passed secret messages for the Confederacy and were eventually imprisoned for it, but continued to elude their guards. Elizabeth Van Lew, an abolitionist and Union sympathizer living in Richmond, put together an elaborate espionage ring and hid escaping Union soldiers in her home under the nose of Confederate family members and detectives. Author Karen Abbott breathes life into each of these women as they lived out their lives during some of the bloodiest and most divisive years in U.S. history, brushing elbows with larger-than-life historical figures such as Alan Pinkerton, Mary Todd Lincoln, Stonewall Jackson, and Emperor Napoleon III. If you like espionage thrillers, encrypted complex codes, secret signs, spy networks, hidden rooms, and daring disguises, don’t miss this book. Bestselling NYT author Karen Abbott also wrote Sin in the Second City and American Rose.